Every PLC has a feature to lock the program and Data Words inside the PLC, so that no one else can see and copy the program made by you. We do a hard job to make PLC Programs and thus also wants that no one else should take the credit of our hard work. In this article we will see "how to set and release the password in Omron PLC". To set the password in Omron PLC like CPM2A, CP1E, CP1H etc., first make your program and after that in the left hand side project workspace is there. 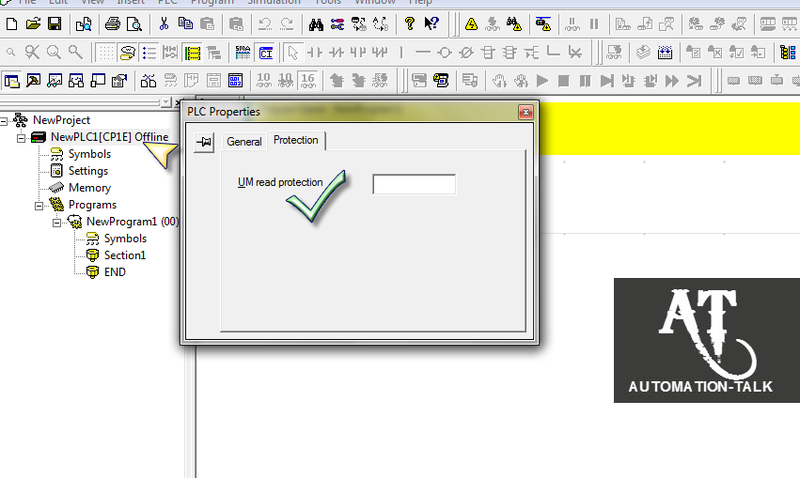 Right click on the PLC name and select Properties and Under protection tab you can set the PLC Password. See below picture for a better Understanding. You can also Release the Password. 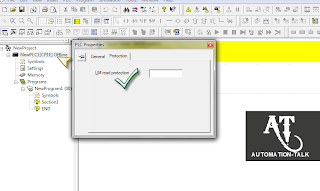 To release the password just Select PLC tab -- Protection and then click on Release password. Once you have set the password in Omron PLC for Program and memory data then no one can Upload the PLC program without knowing the password. Also, the password will always be saved in the program and you can see it if you forgot what password you have put. Also check out the Step by step procedure for removing PLC Password. Don't forget to subscribe to get all PLC, HMI and SCADA updates in yours Inbox.